Conferences | Living with Motor Neurone Disease - One Day at a Time! I’ve had an interesting day today, one that has given me a further opportunity at raising awareness of MND. The roots of all this go way back to last year when Rachel, my Social Care Manager and part of my local hospice team, approached me to see if I would be willing to participate in an MND study day that they intended to run for healthcare professionals. I readily agreed as I have always been keen to help raise awareness of this disease, although normally of course my efforts are channelled through this blog which in itself consumes a lot of my time. For one reason or another it never took place last year and I was beginning to wonder if it ever would, but a few months ago I got the word that it was going to take place in June. The original idea they had for my part was to record me talking about MND but then at a late stage in the organisation Rachel decided that it would be nice if I could actually come along and talk in person. So that is what I did! The hospice had arranged a modified community transport minibus to come and pick me up at 9 AM which meant poor Ann had to get up extra early to be around my house by 7:15 AM so that I could be washed, dressed and fed before it arrived. Debbie arrived an hour later to help Ann get me downstairs and into the wheelchair, and by the time we were ready to leave Alli had joined my little travel party. 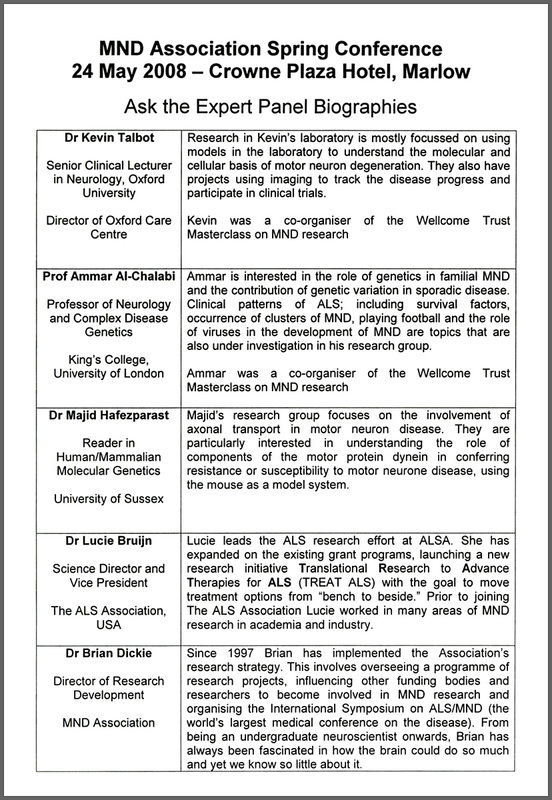 The MND study day was held at the ARK Conference Centre, adjacent to Basingstoke and North Hampshire hospital. The day’s programme ran from 9:20 AM through to 4:30 PM with the day’s events kicking off with a talk by the MNDA Regional Care Development Advisor which gave insights into MND and the role of the MND Association. As part of her talk there was a video focusing on the lives of four different people who have MND. Sadly the end credits revealed that three of these people had lost the fight. This was followed by a talk on challenging symptoms by a consultant in palliative medicine for Sue Ryder Care. After a mid-morning coffee break one of the doctors and consultants in palliative medicine from our own hospice gave a talk on cognitive challenges in MND which suggested that it was far more common than first thought. Before wrapping up for lunch we split up into three large groups for a series of patient and carer perspective workshops. And so for the next hour I was the guest speaker being interviewed and talking about my experiences of living with MND. It was a bit of a struggle talking for so long and I found myself frequently pausing to take a breath before continuing. But apart from that I found the whole experience an enjoyable and rewarding one. Straight after lunch and for the next hour there were small group discussions and a talk on dealing with difficult decisions and advanced care planning. The final talk of the day, which followed a coffee break, was presented by a clinical psychologist who talked at length about compassion fatigue and the risks for the healthcare professionals. It had been an interesting day and it was encouraging to see that it had been fully subscribed with over 80 healthcare professionals ranging from GPs and occupational therapists to physiotherapists and speech and language therapists. It felt good to be a part of something that would help educate people dealing with MND. Afterwards Rachel informed me that there had been some very positive feedback on my workshop, so that was nice to hear. For me personally it was also a wonderful opportunity to actually get out of the house again (for only the third time this year). I would like to say a big thank you to Ann, Debbie and Alli for taking such good care of me today. Before I sign off just have to mention a short four minute video that was shown at the close of the day’s events. There was no introduction or explanation as to why they were showing it which was strange because it had nothing to do with MND. In fact it was the complete opposite of what it means to have MND… and that of course for me was the message. This lovely feel-good, inspirational and heart-warming video clip had me both smiling throughout and feeling envious that I couldn’t participate. I’m not going to spoil it and say too much but if you want to see something that can bring a smile to your face through the simple actions of this one-man and how he’s brought people of different countries and cultures together then take a look at his video which you can view below. Enjoy! Yesterday I had the opportunity to attend a conference hosted by the Motor Neurone Disease Association (of Great Britain). Every year the Association hosts a series of spring conferences that are designed to provide people living with MND (and their carers) an opportunity to learn more about care and research whilst also enabling people to share their experiences of the disease and make new friends. Having personally been living with a diagnosis of MND for six months now and still busy gathering as much information as I can to build up a clearer picture in my own mind, I was keen to experience first hand what such a conference would be like. I have a fairly inquisitive mind and therefore I am not the sort of person who believes that ignorance is bliss. I am more of the opinion that knowledge is power and therefore I felt that I owe it to myself to find out as much as I possibly can so that I am in a better position to make informed choices as the disease progresses. Having said that I have no wish to make MND my life. I already have plenty of hobbies and interests to keep my mind and body active (as can be seen in my profile) and that is where I will devote the time I have remaining (along with my family) as I want to spend that time doing things that make me happy not sad. MND is just the disease that I am forced to live with. Nevertheless it is still my intention to keep a finger on the pulse of research and so that was the main driver for me today. It was also my first real opportunity to see the face of the MND Association and to meet face-to-face with some of the people actually out there at the coal face researching to eradicate this terrible disease. So yesterday morning at shortly after 9am I was collected from my home by two committee members from the North East Hants branch of the MNDA and driven to the Crowne Plaza hotel at Marlow. It’s just under an hour’s drive and we arrived in plenty of time to go through registration and be given our delegate packs and badges and to grab a drink before the conference started. As I sat there sipping my tea I was left in no doubt that this was a conference for MND. Scanning around the hallway I could see people moving about in their powered wheel chairs or walking on crutches, carers by their side. It’s always a bit distressing when you see someone who is further along the journey then yourself and in days gone by before I knew I had it myself I would see wheelchair bound people and feel sorry for them but now whenever I see such people I see a glimpse of my own probable future, one which I cannot walk away from. And at times it sends a shiver down the spine. 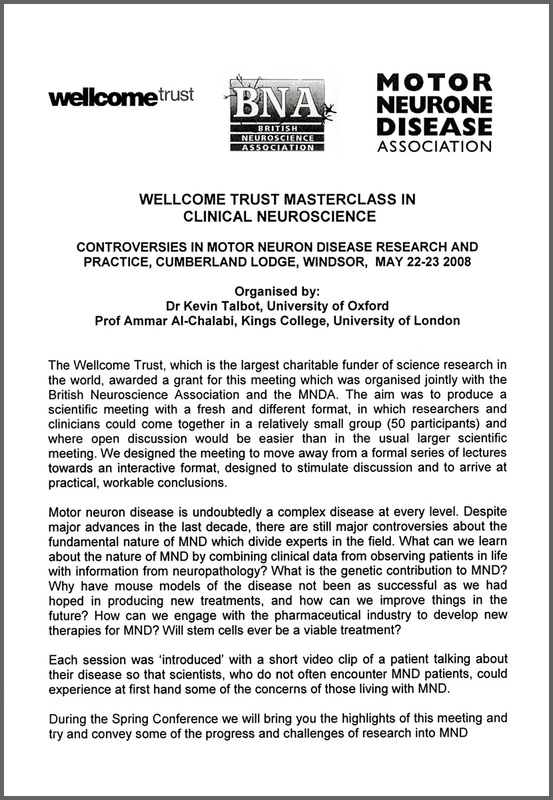 The conference kicked off with an introduction by Dr Kevin Talbot of the University of Oxford on the recent Welcome Trust ‘Masterclass in Clinical Neuroscience’ which had been running on the three days prior to the Spring Conference. Apparently the format and structure of this special meeting had been designed in an unconventional way to deliberately stimulate discussion amongst the intentionally kept small number of researchers and clinicians. As the talk proceeded I found myself wishing I could take a few notes. I certainly had the opportunity as each table had plenty of writing materials, but I have difficulty writing and holding a pen for any length of time these days (which is why I prefer to use a computer). Unfortunately my memory isn’t so hot on remembering lots of medicals facts and figures either but in summary I think the conclusion to the talk was that if we are to make real progress in defeating this disease then more collaboration (between countries, the pharmaceutical industry, and the research establishment) will be required and that the focus should be on biomarkers, genetics and model systems. I found Dr Talbot to be a very articulate talker but also one who has that ability to talk at a level that we ordinary folk can understand. After the introductory talk there was an informal question & answer session in which a group of experts split up and worked their way around the tables thus giving everyone an opportunity to raise any questions they might have regarding the talk or research in general. We were fortunate to have Dr Talbot at our table and I took the opportunity to raise a question regarding the results of the Italian Clinical trial in which Riluzole and Lithium Carbonate were proscribed. Back in January there had been a lot of activity (and hope) on the Internet that the drug combination had dramatically decreased the disease progression. In fact some people were going as far as claiming that it had stopped it dead in its tracks. I had already brought all this to the attention of my own Neurologist who had said that he would look into it. But because I was not due another appointment for some time I was curious to find out what other people in the field thought. Dr Talbot’s opinion was that the science was flawed but nevertheless said that a clinical trial with a larger sample size was being put forward for consideration late this year. To round off the first half of the conference there was an Ask the Expert Panel discussion in which anyone could raise questions that a member of the panel would attempt to ask. One interesting thing I did learn about that I had not heard of before was a form of hardware-assisted diaphragm stimulation. Not sure exactly what it was called now but basically I think the principle was a bit like that of a heart pacemaker but instead it would help to keep the diaphragm working through electrical stimulation. I’m not in need of anything like that at the moment as I am not aware of any breathing problems; in fact the results of my last lung efficiency test suggested that performance was above average. However it is something to be aware of as it is the weakening of the breathing muscles which often dictate life expectancy. So if a technology is being developed that can prolong life by stimulating the diaphragm muscle then that is something to keep in mind for when the time comes. From early test results that have been published it would seem that diaphragm stimulation is beneficial although it is important to understand that it does not prevent disease progression. One person raised the interesting question of whether or not MND was a modern day disease, perhaps a combination of lifestyle and environmental factors. The general thinking is that it has probably been with mankind a very long time but because human life spans were typically much shorter in olden times then they are today (and MND is far more prevalent in the 50-70 year age range) people never lived long enough to get it. They were too busy trying to avoid being eaten by Sabre-tooth Tigers or trampled to death by Woolly Mammoths :-). After a three-course lunch there was a ‘Care – Hints and Tips’ session in which everyone had an opportunity to share anything they had discovered that made living with MND that bit easier. The final session of the day was supposed to be a presentation on care but this was conspicuous by its absence. Instead there was a talk by Dr Brian Dickie, the MNDA’s own Director of Research Development who talked about research into care – words which are not normally used together. Like Dr Talbot I would say that he was a ‘people person’ and a natural speaker who explained things in non-technical terms. And that brought to a conclusion my first conference on MND. To think, if someone had told me a year ago that I would be attending a medical conference I would never have believed them. How strange life can be at times… So was it a good experience? Yes I’m glad that I went as it gave me a real opportunity to listen first hand to people who are genuinely trying to make a difference to people’s lives. I’m just grateful that there are such people out there. All neurological disorders are tough nuts to crack and with motor neurone disease you’re looking at tiny microscopic structures. A nerve cell is just 1/30 000th metre in diameter. This is biology on a different scale and is a far cry from being able to see and hold one of the major organs in your hand. No wonder why we cannot cure MND – we cannot even find the little blighters, they’re just too small! The way I personally look at MND research and the way in which we are progressing is to use the analogy of a big 5000 piece puzzle. Now over the years some very dedicated men and women throughout the world have been able to turn over a few of the pieces and we’ve been able to see their colour and glimpse a fragment of the image but we still have no idea what the big picture is or how all the pieces lock together. Dr Brian Dickie used the analogy of trying to climb a huge mountain, whilst not being able to see the top because it was shrouded in mist, and having no idea of how to get up there. I guess either one works but the point remains the same – we still have a long way to go, but thankfully research activity in recent years has started to accelerate. Let’s just hope that trend not only continues but yields ‘real world’ results. We desperately need a major breakthrough. One thing I did notice whilst at the conference and ‘people watching’ was an absence of people who looked unhappy, distressed or depressed despite the severity of some of their disabilities. And that sort of bears out what I have read in the past that MND is not known for being responsible for depression unlike some other neurological diseases. Interesting! Before I sign off let me just say thank you to Coral and Linda for taking me to the conference and looking after me throughout the day! Very much appreciated ladies!